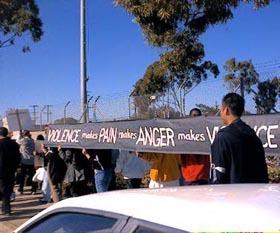 Sunday December 20th, 1998 I was able to attend the Non- Violence Peace March. The march started with two groups. 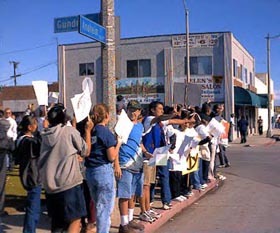 One group marched from Saint Mary Hospital and the other from United Cambodian Community Center on Anaheim Street. Over 200 people participated. Among the participants was C-HOPE, Cambodian Humanitarian Organization for Peace on Earth. 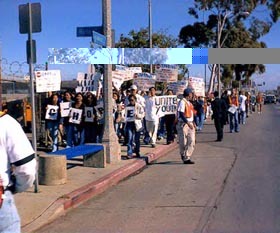 The two groups marched and converged at McAuther Park on Anaheim Street. Over 20 different organizations were on hand to help assist and promote their organization. I heard stories from the speakers about their personal and tragic experience of senseless violence in their community. The speakers encouraged everyone to please stop the violence.